I’m very excited to announce that I have introduced a new product to my little shop, and even more pleased to say that it is one for the boys! It aways seems that boys are somewhat overlooked in the world of handmade, and hopefully this will help change that, just a little! So here it is: the deluxe kilt package! It comes with a kilt, waistcoat, tie or bowtie, and flashes, so all you need to finish the outfit is a shirt, socks and shoes. 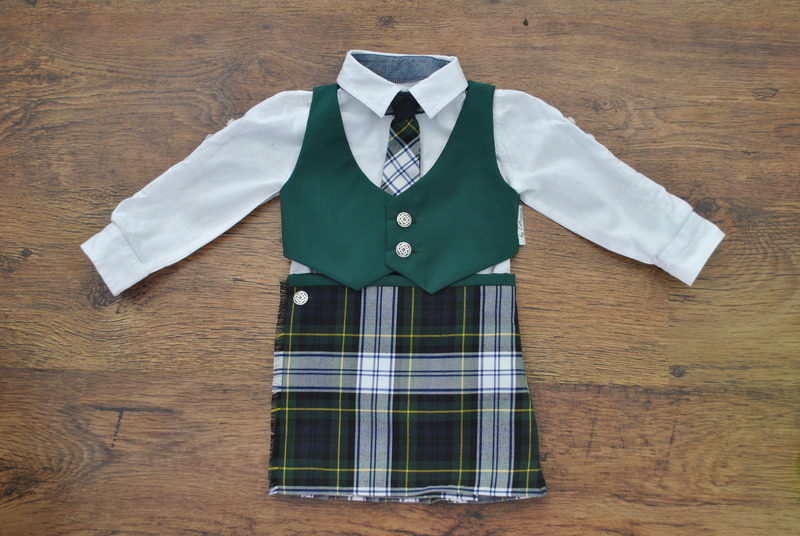 The kilt is made from polyviscose tartan, and not wool, which means it’s much softer against the skin (for the little one wearing it), and it’s machine washable (for us parents who have to consider such things!). It fastens with a button and a popper, both of which can be moved along the inner front panel to extend the life of the kilt. 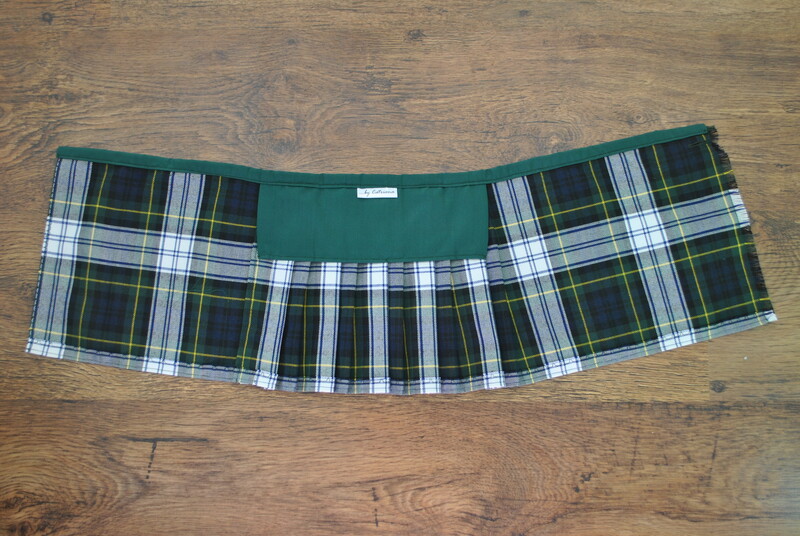 The inside of the kilt is lined over the pleats to make it more comfortable and to keep the pleats sitting where they should. 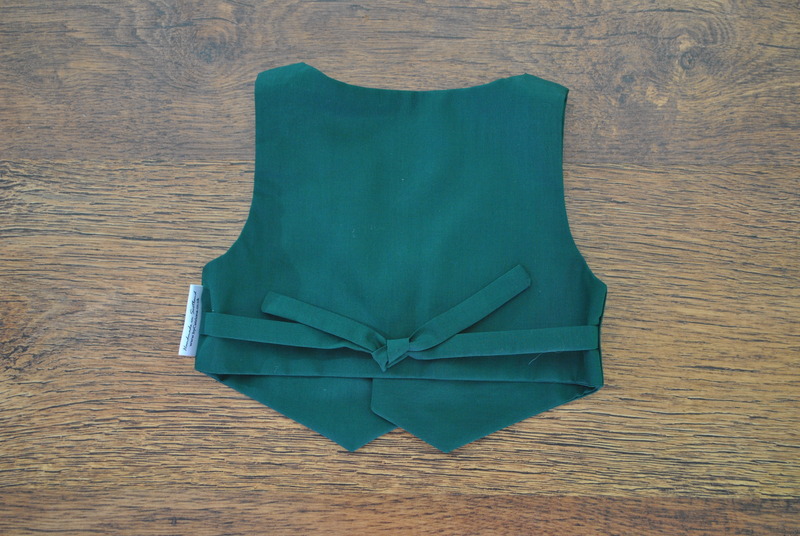 And the waistband is finished in lovely soft cotton so that it won’t rub on baby’s delicate skin. There are also more pleats than in my basic kilt, which means that it is a little heavier and will sit better on even wriggly toddlers! 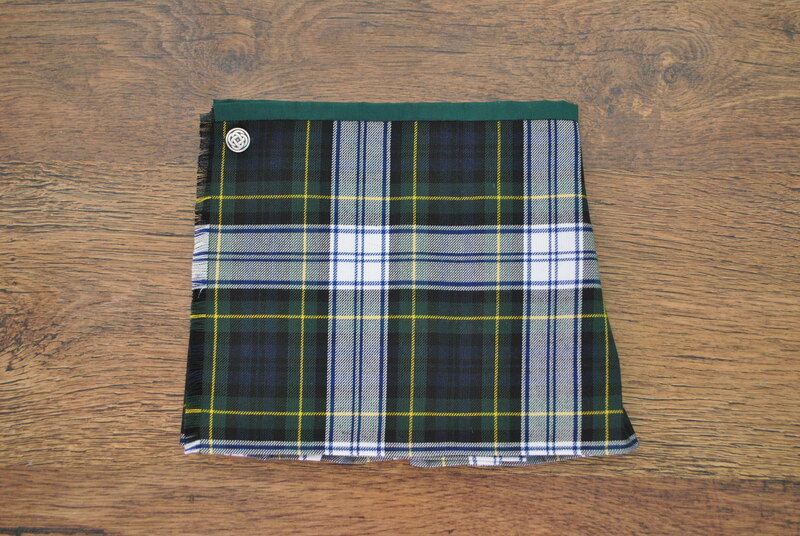 It comes with a waistcoat made in a complimentary colour, picked from the colours in the tartan. The lady I made this outfit for asked for a green waistcoat and I chose this bottle green cotton which nicely coordinated with the dark green in the Dress Gordon tartan. 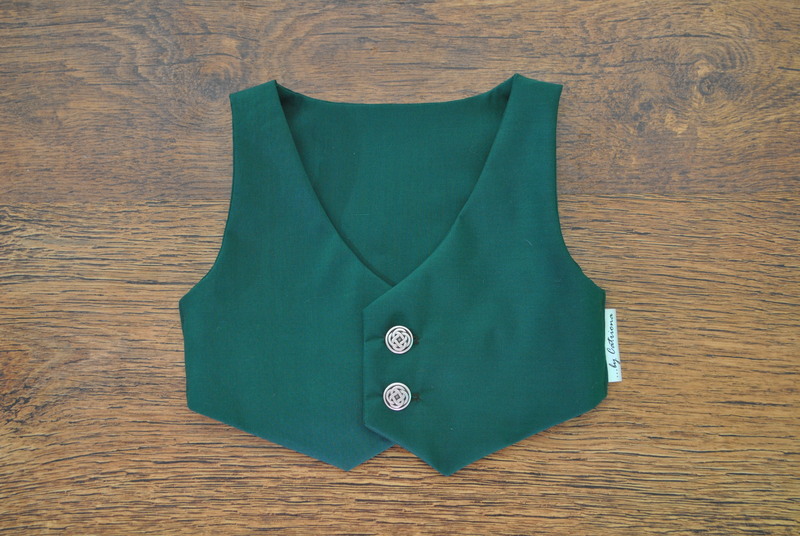 The front panels of the waistcoat are lined with medium weight interfacing to give them a bit more structure, and there is a tie at the back to give it a little adjustment. The waistcoat and the kilt both use the same celtic buttons. This outfit came with a pre-tied tie, but the package is also available with a pre-tied or self-tying bowtie. 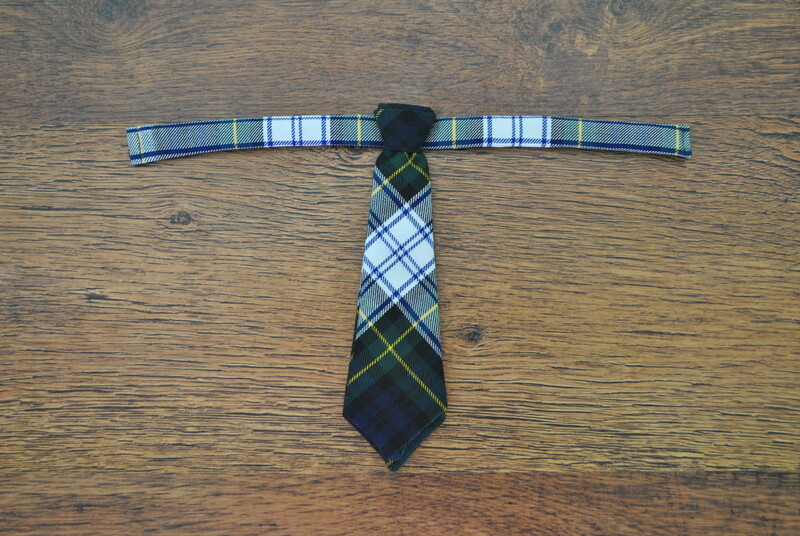 The tie is made from the same tartan as the kilt, and fastens at the back of the neck using a popper. This means that it will come undone if pulled hard so that it isn’t a choking hazard. When I had finished these three pieces I couldn’t resist laying it all out together to see how it looked. And I have to say I was pretty pleased, even if I do say so myself!